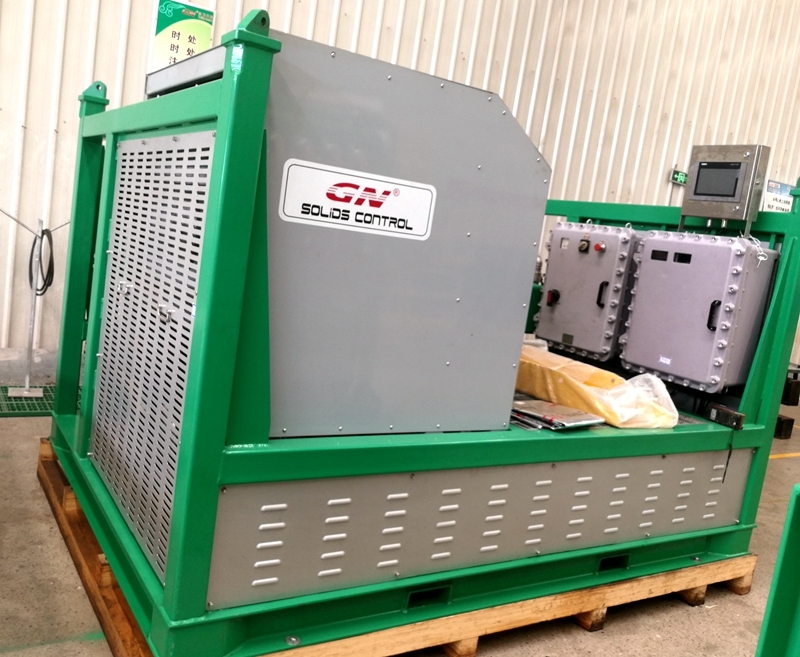 Recently GN solids control shipped one unit of fully hydraulic drive decanter centrifuge to Middle East, this is a new developed decanter centrifuge except for electric drive decanter centrifuge. Till now we have already developed many series decanter centrifuge to be applied for many industry applications. 1) The hydraulic drive decanter centrifuge is normally used in high temperature ambient for heavy mud with flexible bowl and differential speed, especially in middle east, the environmental temperature is very high. 2) Compared with the electric drive VFD decanter centrifuge, the fully hydraulic drive decanter centrifuge with compact design, all the driving system, motors, centrifuge bowl assy are installed on the same skid for convenient transportation. The adjust differential speed allows a better solids separation result for heavy mud. 3) Except for FHD decanter centrifuge,GN solids control also produce a range of VFD decanter centrifuge, with positive pressurized VFD control panel, ABB brand major electric components inside, PLC smart control, HMI interface, stainless steel cover, self cooling tube or air conditioner for high temperature area. 4) The centrifuge bowl is made of duplex stainless steel 2205, and the complete screw is made of stainless steel 316, the screw propeller is protected by tungsten carbide tiles, which is repairable, the solids discharge port and fluids distribution port is protected by tungsten alloy insert, the open propeller design increase the treating capacity and made the treating performance better. The FHD decanter centrifuge has been used for drilling fluids recycling, drilling waste management, waste water treatment, mining tails separation, dredging slurry separation, oil sludge separation, and other solids fluids separation projects. 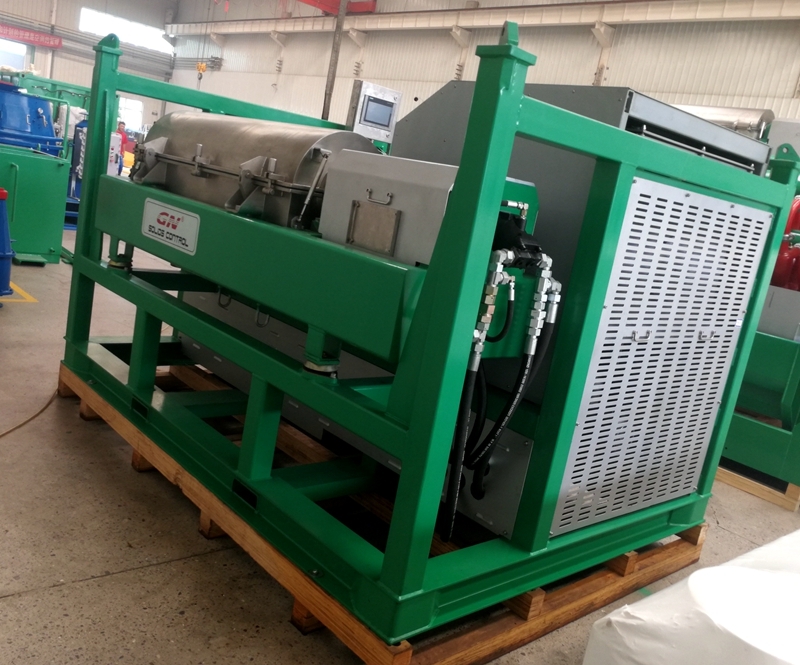 Most of the clients choose VFD decanter centrifuge because of its easy maintenance, easy operation and reliable performance, but some clients choose FHD decanter centrifuge, GN can offer both of them as per client’s request.